Heat oven to 375°F. Spray 1 1/2-quart casserole with cooking spray. Place rolls on cutting board; let stand 10 minutes to thaw. Meanwhile, in 10-inch skillet, heat sausage over medium-high heat, stirring constantly, until brown; drain. In medium bowl, beat eggs, milk and syrup until well blended. Cut rolls into 3/4-inch cubes; place in bowl with egg mixture. Stir to coat. 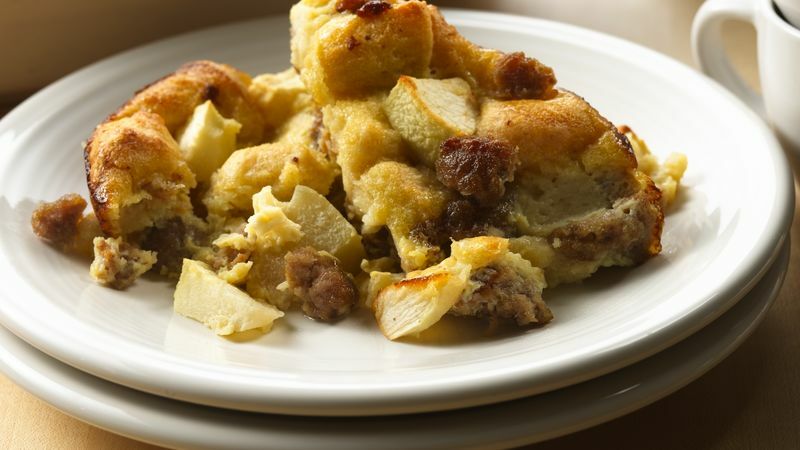 Stir in sausage and apple; pour into casserole. Bake 35 to 40 minutes or until puffed, golden and knife inserted in center comes out clean. Let stand 5 minutes before serving. Stir in cooked, crumbled bacon in place of the sausage.